This position is usually reached from two initial positions. Black has played a knight's move either from a one space check, or from a knight's check. The third possibility, where White has played a checking move of an existing knight's move development, is exceptional, but at least one exception is well known. 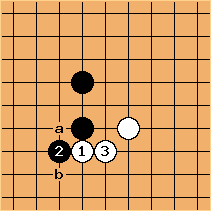 The first move to think about is to cut apart Black's knight's move, supported by the existing White stone. After , Black can capture in a ladder. The prerequisite for cutting through the knight's move is that the ladder doesn't work. If the ladder doesn't work, both sides can strengthen their weak stones to end up with this pinwheel formation. Since the first cut depends on a ladder, one may be tempted to cut through the keima this way. After , there is no ladder. However, there is another drawback. 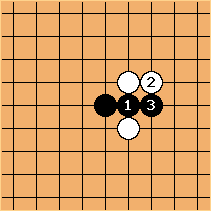 In comparison with the "good" way of cutting, where White's stronger group forms a simple connection, here White forms a diagonal connection, meeting a simple connection. As said before, in such meetings, straight is much better than diagonal. Hence, this way of cutting is not preferred. This is not to say that it will never be the solution. is a supported contact play. 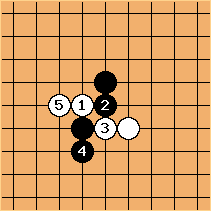 is the basic answer, a hane staying away from the supporting stone. assures the connection of her three stones, reinforcing the whole position. Next, Black can choose a, to block White's development in this direction, or b or c to connect. 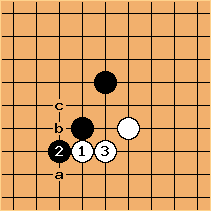 The hane inside White's knight's move is complex. 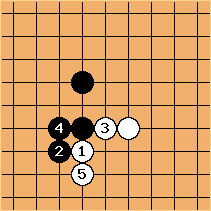 Black must somehow restore the connection of his initial structure while giving some sense to . In many cases this will prove too much to handle, so this technique is reserved for special circumstances. 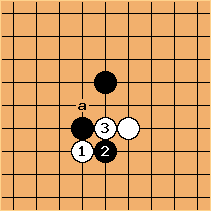 Another way for White to reinforce by playing contact moves is the attach and extend technique. The White keima presses on the black stone towards the top. 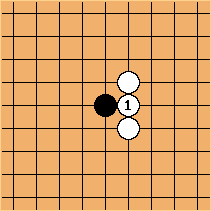 Black's basic answer is a stretch, away from the supporting stone. Both try to get ahead in this race building influence to top and bottom respectively. Black has also the more aggressive option of cutting through the keima. In this severe cross-cut position, White has the advantage of moving first. Black has basic fluent development towards the top and influences the left. White's best possibility for development is towards the right. 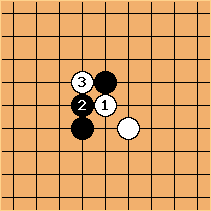 First, she can choose to reinforce with a contact sequence, at the expense of reinforcing Black's influence to the left. 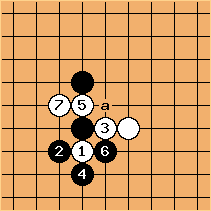 Again, the outside hane is easiest for Black. 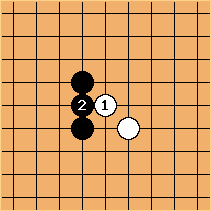 Again, White draws back and Black can play a to connect (more stability) or b to develop. A special technique is to bump with 3. 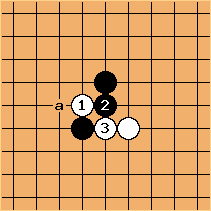 If Black restores the connection, develops towards the bottom and creates some local eyespace. The technique is special because Black has room to makes things complex: makes a ponnuki and after , a can be a troublesome cutting point. Peeping is bad, locally. Black has uninterrupted and straight development. 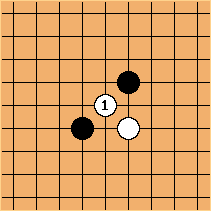 White has diagonal, interrupted development. 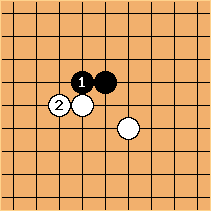 is a move only played in White's sphere of influence, making the opponent's structure heavy before attacking. 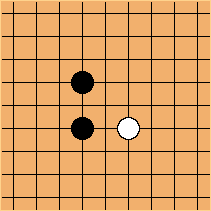 Whenever a stone's basic development is blocked in two ways, like here, White's basic instinct is to cut Black's stones apart at . The fact that Black doesn't care about being cut in this severe way, means that strategically his stones are likely strong, or that he is strategically prepared to sacrifice one. 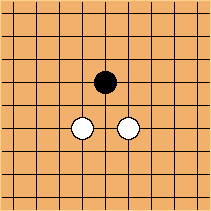 This position cannot be reached through normal play by White (without support). Her basic reply to any of the diagonal checks would be to stretch, not to jump. Hence, this must be reached by Black playing his stone against White's jump. The basic move here is to connect at . White's stones are firmly connected and have 7 liberties, giving a very stable position. Black's stone is worth little. So, why would Black ever play this move? White loses flexibility. In hostile spheres of influence this means that her stones become heavy, difficult to save together, impossible to sacrifice partly. 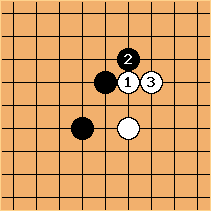 There is a specific tactical purpose: the exact position of the black stone makes a sequence possible. Typical example: a ladder breaker. If somehow White cannot answer the peep, Black will not lose the opportunity to push. White must not hesitate but block and maintain maximum overall connectivity. Black can next choose which way to cut. 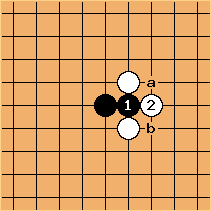 If White yields with , the difference with the previous diagram is huge: Black has cut White, but stays firmly connected himself, whereas in the previous diagram he must crosscut. Black is unlikely to play contact moves here, since they are technically bad, so typically he will develop to the upper side, where there is most space.